This project consisted in optimizing Tph2 Mouse Genotyping by PCR protocol for a well established lab located at the University of Ottawa. The customer had difficulties genotyping their Tg(Tph2-cre/ERT2)6Gloss mice from Jackson Labs. They were using Taq DNA Polymerase from ”BasicBio”. Cost was an issue, but performance was critical. The researcher provided us with PCR primers 11679 + 12523 for transgene detection and oIMR8744 + oIMR8745 as an internal control, 2 hemizygous mice gDNA samples and mice gDNA samples that are negative for the TPH2 transgene. Please find bellow what we have accomplished using Transgen Biotech’s EasyTaq and TransTaq HiFi DNA polymerases. DNA Polymerase: EasyTaq and TransTaq HiFi DNA Polymerase. We’ve shortened the PCR run time by ∼30 min as compared to the Tph2 Mouse Genotyping PCR protocol the researcher was using. This allowed the researcher to save time on their routine genotyping experiments. 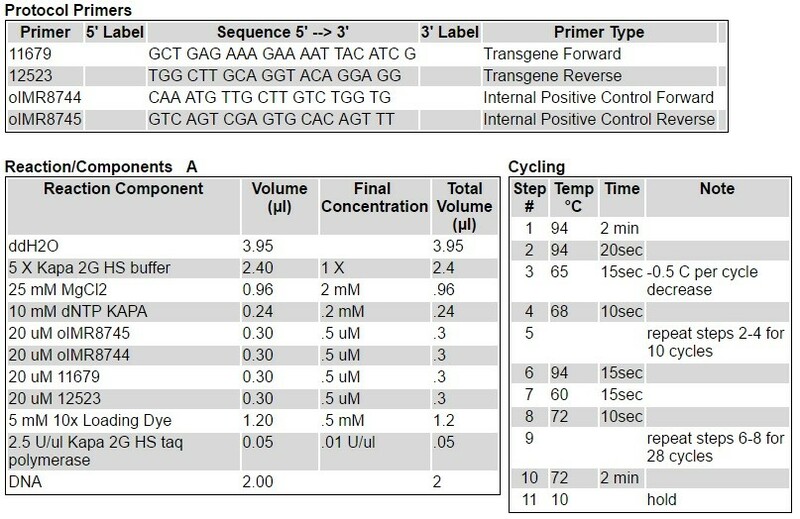 Using a much shorter PCR cycling protocol than suggested by Jackson labs for Tph2 Mouse Genotyping and combining 4 primers for ”control” or ”transgene” allele detection, both EasyTaq and TransTaq HiFi (a hot start DNA polymerase) successfully amplified the transgene and control bands. This assay does not distinguish hemizygous from homozygous transgenic animals.